When roller derby turns Japanese, things get a little crazy. Part 3 of the Another Derby Series. For an introduction, explanation, and chapter index for the Another Derby series, click here. (Make sure you start from the beginning!) For Another Derby bonus content, like photos, rare derby videos, and other nuggets, follow the WRDN Twitter and look for tweets tagged with #anotherderby. By most people’s accounts, it began in Texas in 2001, when women began to play the game legitimately for the first time. A year later, flat track roller derby would be invented for the first time, and with that came standardized rules that, among other things, allowed roller derby to be played with just one jammer on the track for the first time. The accessibility of the game eventually allowed everyone—men and women—to play together at the same time, for the first time. The game grew so quickly around the world, a World Cup was commissioned, and teams representing their countries played against one another for the first time. By most people’s accounts, that’s the history modern of roller derby. But in reality, the history of modern roller derby, the history of flat track play, the history of power jams, the history of co-ed roller derby, the history of true international play, and the history of legitimate gameplay itself goes back much further than that. In fact, none of these historic firsts in roller derby can even be claimed by the country that invented the game 80 years ago, and re-invented it for the 21st century. That honor goes to one of the last countries you’d imagine would have a place in roller derby history. 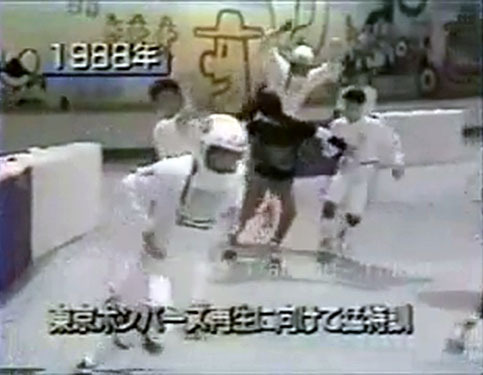 It’s flat-track co-ed power-jam legit roller derby…in 1988 Japan. 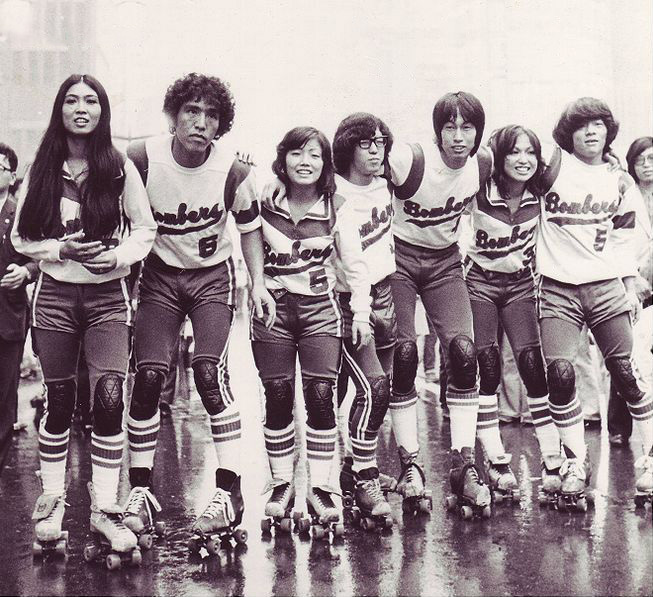 Believe it: Japan gave birth to modern roller derby before there was modern roller derby. Through its own transformation from scripted derby to that of a pure sports league, and an intriguing contemporary prologue, Japan’s branch of derby is a fascinating chapter in the history of the game. If you’ve never heard of it, buckle your seat belt—this is roller derby like you’ve never seen it before. In 1973, the golden age of derby came to an abrupt end when Jerry Seltzer was forced to shut down his Roller Derby promotion, finally succumbing to the financial worries that had plagued him and his father for decades. On the other hand, Bill Griffiths and his rival Roller Games promotion showed no signs of slowing down. In fact, he could hardly contain the mania to the United States. 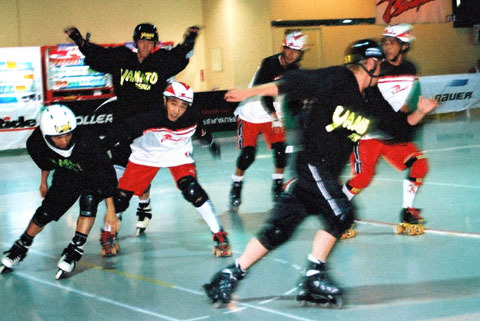 A few years after Roller Games had exploded onto the American sports scene, Griffiths partnered with new and existing skating leagues in Canada, Australia, and Japan. The leagues in these four countries joined forces to collectively skate as the National Roller League, or NRL, later to become a part of the greater Roller Games International empire. Though the number of teams in the international leagues were small compared to the six that Roller Games had stateside, they were very popular, just as popular as their American counterparts. Griffiths took advantage of this fact to set up all-star tours featuring RGI skaters from each of the countries against each other. Or in the case of the United States, the World-Famous, World-Champion Los Angeles Thunderbirds, who Griffiths made to be America’s Team when it came to roller derby. Their popularity crossed borders, making the T-Birds truly known and loved the world over—or at least, known and loved enough to be able to play in front of sold-out crowds in the countries they toured through. On one such tour in 1974, the T-Birds traveled to the Land of the Rising Sun to play a series against RGI Japan’s top team, the Tokyo Bombers. 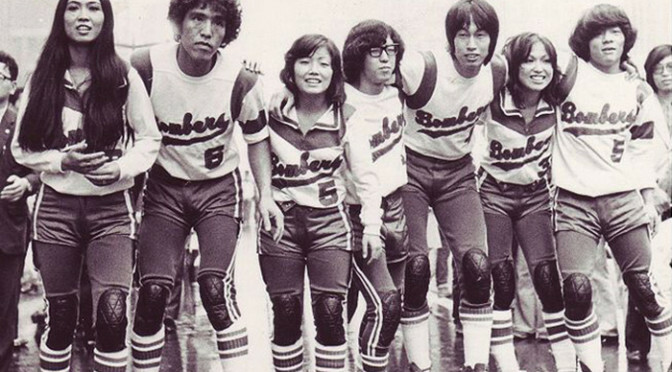 The Tokyo Bombers were Japan’s iconic roller derby team. Formed in the 1960s as a part of RGI’s rapid international expansion, and named as a tribute to the San Francisco Bay Bombers1, the Tokyo Bombers had a lot of great skaters by the time the T-Birds landed in Japan. But they also had many young skaters on their roster, most not yet 25 years old. This youth movement, coupled with the team’s greater experience, made them extremely popular with crowds of their native Japan. When the Thunderbirds came to town, it was a can’t miss proposition. The series played between the T-Birds and Bombers was extremely successful. Check out the crowd at this game between the teams. Oh, and make note of player #7 in white, who you’ll see at the beginning and end of the clip. Little did anyone know at the time, he was destined to become a part of roller derby history. That player? He’s an 18-year old kid by the name of Hiroshi Koizumi. Like most players in Roller Games International, skating was not Koizumi’s main profession at the time. In addition to training and performing for Roller Games, he was also a student going to school. But that’s not to take away from his skating abilities—he was a damn good roller derby player. Especially, for his age: He started skating with the Bombers at just 15 years old! The dynamite combination of youth and skill made him one of the most popular players on the Bombers. 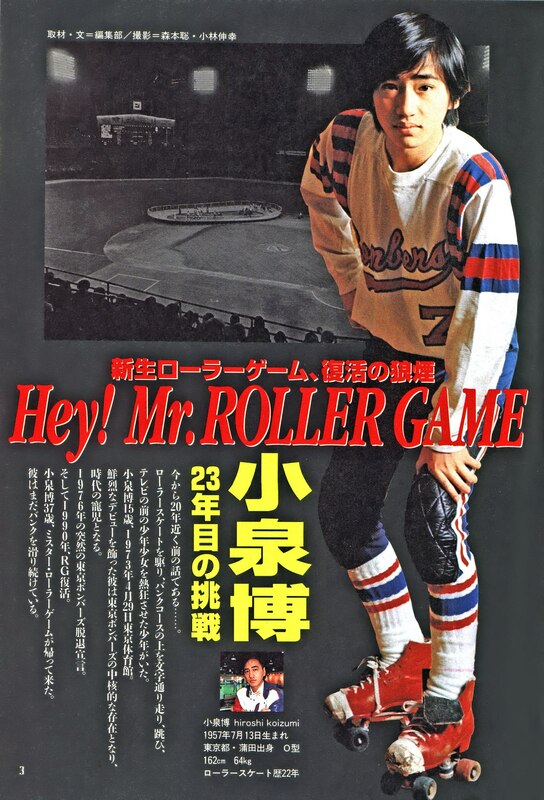 Eventually, Koizumi became the face of Roller Games in Japan, leading the franchise through the rest of the 1970s and into the early 1980s. Hiroshi Koizumi eventually came to be known as “Mr. Roller Game” for guiding Japanese roller derby into a new generation. Meanwhile, back in derby’s homeland, Bill Griffiths started having problems maintaining the American popularity of Roller Games. Among other things, this prevented him taking the T-Birds back to Japan, or anywhere else outside of North America for that matter. Despite this, the Japanese satellite continued to thrive on its own, with ratings-records television coverage of games on sports networks complementing the live events that was RGI Japan’s bread and butter. Though popularity leveled off somewhat as the years went on, Japan didn’t seem to experience the same derby burn-out that happened in America, where Griffiths or the Seltzers had to take desperate measures just to stay alive. In contrast, the Bombers were positioned to comfortably play games several times a year without having to worry too much about things. But soon enough, there was a reason to start worrying about things. In the mid-1980s, Japan’s urban areas started to become more densely populated. This, in turn, caused the price of real estate to rise sharply. As facilities got smaller and more expensive, so too did suitable locations to house a banked roller derby track. With Roller Games’ popularity in Japan stable—but not stable enough to cope with a certain increase in operating costs—something had to be done in order to keep the future of game alive. Extraordinary problems call for extraordinary solutions. Enter Hiroshi Koizumi. By this time, Koizumi was the head of a Tokyo-based production company that, among other ventures, ran area skate parks and roller rinks. Koizumi realized what would happen if nothing was done to save Roller Games from imminent doom, so he came up with an idea: Get rid of the expensive banked track and the big arena to house it in, and instead play games in his roller rink. In other words, play roller derby on a flat track. In today’s modern era of derby, this idea doesn’t seem radical. But at the time, it was crazy talk. Consider: Since 1937, all forms of the game had only ever been played on a banked track. For five decades, the angled Masonite skating surface had been the only field of play the sport had known. Taking away the banked track from roller derby would be like taking away the field from football…it would never work! The mere suggestion was laughed at. Fans were not initially behind the idea, figuring that removing the banked track would take away the speed and excitement of roller derby. Even derby skaters of the era were skeptical. The magnitude of the task Koizumi faced, not only in translating the speed and hard-hitting nature of the traditional banked track game to the flat track, but also convincing people that it could work, was daunting. He tackled these problems by radically rewriting the rules of roller derby to suit the venue he had available to him. The first change made was to the most basic rule of roller derby: Instead of both teams fielding a jammer on every jam, Koizumi’s new game would give only one team a jammer. That is, one team plays exclusively offense with a jammer, and the other plays exclusively defense without a jammer. Teams would alternate offense and defense on every jam, instead of play both simultaneously. The next change he made was a byproduct of the larger, wider track surface the new game would be played on. Instead of corralling teams into an arbitrary pack, he gave complete freedom to blockers to engage opponents anywhere they pleased. Coupled with tweaks to rules from traditional derby that gave the defense more ways to force a jam to end prematurely, this gave incentive for both teams to go on the attack—even if only one of them had a chance to score on the jam. To address safety concerns, Koizumi required all players wear hockey-like body padding and real helmets, not just the plastic caps that derby players of the past were made to wear, if they did at all. Also knowing how much of a target they would be, he also mandated that the jammer wear a full-face helmet for his protection—important, since jump blocks and leg blocks were made to be legal. But the most important difference between traditional roller derby and Koizumi’s new game didn’t have anything to do with the rules. This time around, there would be no scripts. Players would not be told to get into fake fights, either. Plays would not be predetermined, and outcomes would not be decided beforehand. To put it plainly? Koizumi wanted his players to play his new roller derby game legitimately. So in 1988, armed with new rules and a new attitude on how to play by them, Koizumi began the process of finding skaters to form teams. In a few years, he had trained enough players capable of playing in the hardest and fastest form or roller derby the world had ever known. 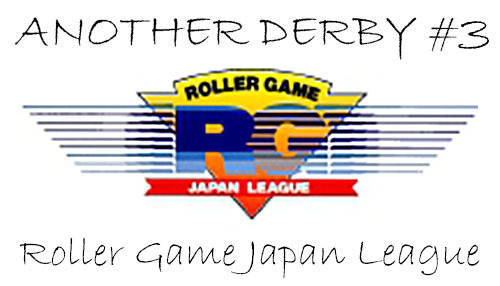 And in 1990, the first full-fledged legitimate-skating roller derby league to skate since the early 1950s was launched as Roller Game Japan League. The success of RGJL was immediate. The naysayers that thought roller derby would never work on the flat track were quickly silenced when they saw Roller Game in action. All the elements of roller derby were there: The speed, the hard hits, the teamwork, the strategy—and for the first time in a long time, the drama of the real sport. Koizumi himself was a participant, skating for the Tokyo Bombers team he helped make famous two decades earlier. Derby fans ate it up. Skaters were also floored when they saw the game, jumping at the chance to be a part of it. This allowed the league to expand quickly; after starting with only two teams in 1990, the Murasaki Sports Cosmos and the resurrected Tokyo Bombers, a new team was added for 1991, the Lightning Jets. The next year, Delta Force was added to the fray, ultimately creating a four-team league that played in an 18-game season from July to December of 1992. Roller Game’s immense popularity put Koizumi in a favorable position. 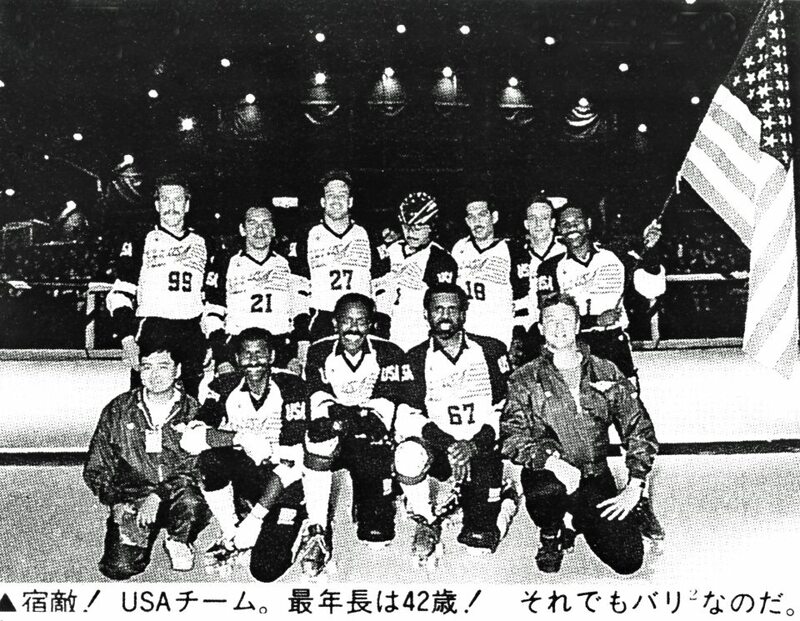 Having successfully saved Japanese roller derby from an uncertain future, he was able to bring it full circle by returning it to the banked track in 1993. But in doing so, he didn’t revert the game back to traditional rules. Instead, he ported his new one-jammer flat-track version of the game to roller derby’s traditional battlefield and found that it worked just as brilliantly on the high banks as it did in his roller rink. This marked a turning of the tables in the roller derby universe. In the past, the game was huge in America, but smaller in other parts of the world. But in the early 1990s, derby was huge in Japan, and quite small elsewhere, particularly in America. A few years removed from the Rollergames TV show craze of 1990, and with no real base from which to sustain any kind of derby platform—scripted, legitimate, or otherwise—it seemed incomprehensible that the country that invented roller derby was being upstaged by the Japanese. But the United States still had many great roller derby skaters, and Japan respected them highly. Wanting to test his country’s top skating talent against the best of the best, Koizumi invited over some of America’s top players for a special series between Japan and the USA. Seeing as how the gaijins hadn’t yet discovered how to play roller derby on a flat track, Koizumi wanted to make the series a fair fight…and it just so happened that they now had a banked track with which to wage that fight on. And so on May 1, 1993, the first-ever world cup of roller derby was contested. The Roller Game World Cup, as it was called, was actually a series that pitted Team USA against four different teams over 7 days. Their main opponent was the All-Japan team, an all-star selection of Roller Game Japan’s best players. But matches were also played against the individual teams of RGJL—the Bombers, the Cosmos, and the D-Jets (a combination of the other two teams). Team USA won all but one of their games. This tour was such a success, they were invited back to play again in 1994, albeit with a slightly weaker squad; Japan fared much better that year. The hot streak Roller Game Japan was on would continue throughout the rest of 1993 and 1994, with games played on the flat track and on the banked track. The international flavor even sprinkled into the regular league games, with an American skater playing for the Bombers during an RGJL season. Not even the ladies could stay away from participating in the league as Roller Game Japan empowered women to skate with men simultaneously during jams, marking the first instance of true co-ed roller derby in the sport’s long history. Everything was working in Koizumi’s favor. Strange, then, that in 1995, it was as if the league just up and disappeared. With all the information available about Roller Game Japan, there’s a huge hole in it during the latter half of the decade. Pictures, videos, and accounts of games are nowhere to be found during that time period. What’s known for sure that the league was greatly scaled back, eventually to be suspended altogether. Whether the craze died down or resources were overexerted (a possibility considering the return of the banked track) is not known to this website at this time. A RGJL game played on August 8, 2001. What is known is that by the turn of the century, Roller Game was being played again. This time around, Koizumi added yet another all-inclusive facet to the game: Inline skaters could play along side traditional quad skaters. Still played in Koizumi’s Tokyo roller rink, three co-ed teams played for a couple of seasons. These events took place in the Internet era, so play-by-play accounts of these final games exist online (in Japanese, or translated into English). But in March 2002, the game came to an abrupt end once again, as if it was only meant to be a special event and not a perpetually sustained league that made a name for itself a decade earlier. Whatever the reason for its sudden disappearance, reappearance, then subsequent re-disappearance, Roller Game Japan ultimately fell into the same boom-bust cycle that all forms of roller derby did before it. Was it a case of over-saturation, giving fans too much of what they wanted? Only Hiroshi Koizumi knows. But there’s no time like the present to ask him: In July 2012, after a 10-year hiatus, Roller Game Japan has made yet another return. Riding the wave of modern derby, Flat Battle: Roller Game is the new incarnation of Koizumi’s variation on roller derby. Still played by the same one-jammer rules, still played co-ed, and still played in Tokyo Dome City’s Roller Skate Arena roller rink—the very rink were skaters began training for Roller Game in 1988—it’s all still the same full-contact, full-throttle game that Japan fell in love with almost 25 years earlier. There are differences from past versions, however. For now, there are only two teams, the Bombers and the Cosmos. Not all of the players on the teams are as good as the skaters that filled Roller Game Japan League in past years. Also, all players are locked-in to wearing quad skates, with no inline skates allowed in games. There’s also another significant, and perhaps most unfortunate difference: The games are not played 100% legitimately. Like the Seltzer era of roller derby, Flat Battle: Roller Game includes a few predetermined plays, with last jams of games being flat-out choreographed to produce an exciting or entertaining finish. (At least, this has been the case in the three games played in 2012.) But the script is limited, as the vast majority of jams are played on the straight and level. Players make an effort to abide by the rules of the game and penalties are called and enforced. And you can forget about there being “fake” fighting (or even real fighting) happening—just like it has always been, none of that happens here. The modern rebirth of Roller Game Japan is—for the time being—a legit-choreographed hybrid version of roller derby. Why Koizumi made the switch to this format is not known, nor is it known if he will eventually flip the switch in the future and make the game a true sport once again. 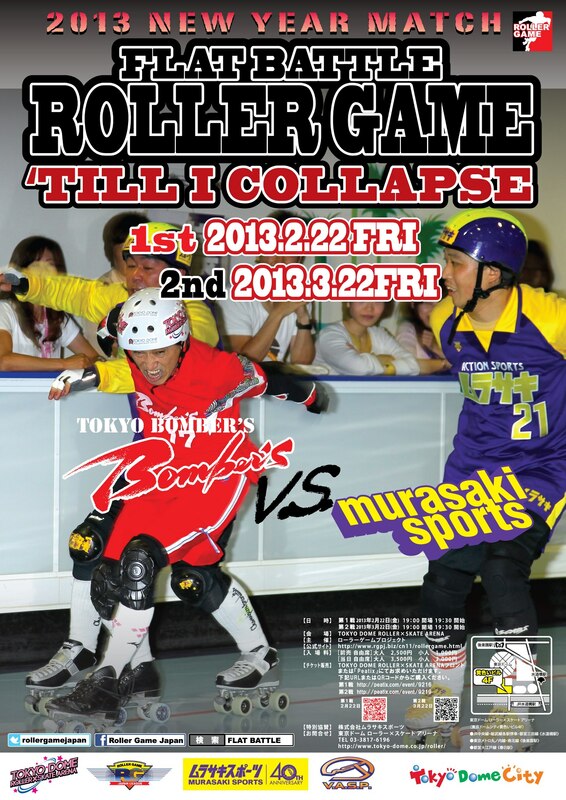 Roller Game Japan is back for 2013. But what is known is that the new Roller Game is taking advantage of its jump into modern times in ways everyone can benefit from. New games, scheduled to be played about once a month, will be live-streamed over the Internet on the Roller Game Japan Ustream channel. Games already played are archived and can be viewed at any time. They’ve also recently set up a Facebook page (English/Japanese) and Twitter account (Japanese only) for photos, videos, and updates on future games. The fact that Roller Game is being played in 2013 puts it in a unique position in the broader scope of roller derby history. With today’s Roller Game Japan being both scripted and legitimate, it acts as a bridge between derby’s entertainment-focused past and its competition-driven future. In fact, its own history has featured an emphasis on one the other at various points. When it was being played legitimately, though, it has a lot it can boast about: It was first form of the game to play derby on the flat track (and use the same rules on the banked track). It was the first employ the power jam during gameplay. It was the first to play true co-ed derby, instead of segregating men and women into separate skating periods. RG Japan was also the first to take player safety more seriously, mandating real safety equipment. Most importantly of all: Roller Game Japan League was the first to play the sport of roller derby for real. Domo arigato Koizumi-san. May your game’s future be as bright as ours. Coincidentally, this wasn’t the first time Japan has lifted a team name from a famous American sports team. Not coincidentally, RGI in America also had a team that “borrowed” the famous roller derby team name from San Francisco, the New York Bombers. What we would now consider “old-school” banked tracks are much more dangerous than the modern banked tracks in use today. But at the time, they were considered very safe, especially when coupled with the high skill and experience level players needed to have before playing games on one. Remember, it was a different era of safety in society back then. To put that in perspective, consider this: The wearing of safety belts in cars was not made mandatory by law in the United States until 1984.